Hello again out there. Sorry for being a bit over a week between posts, but I no longer have internet access in my apartment so I had to find a convenient time to stop off at the library and write. The major development since my last post is the ending of the regular season. It is hard to believe but after 142 games the regular season is over and it is finally time for the playoffs. As a team we had an outstanding year. We spent a grand total of zero games at or below .500 and were in first place in our division for every day of the season. Our team also produced the Eastern League’s Player of the Year (Carlos Santana), Pitcher Player of the Year (Jeanmar Gomez) and Manager Player of the Year (Mike Sarbaugh) in addition to excellent performances by several other players. Heck, our closer Vinnie Pestano was only a save or two behind the league lead and he didn’t play at all after being shut down in early July with an “upper extremity” injury. Personally, I ended the season on a roll that pulled my overall numbers from mediocre at the all-star break to pretty good by season’s end, and I managed to just sneak in under the 3.00 ERA mark so I’d have to consider it a successful season. My long string of good performance was almost marred by a poor outing to end the season, but I managed to minimize the damage, keep my overall numbers in a satisfactory range, and end the season on a positive note. None of those numbers matter anymore, however, as it is now playoff time and the only numbers that matter are the numbers on the scoreboard at the end of the game. We open up the playoffs at home against the Reading Phillies with high hopes. We played well all season and ended the season with eight straight wins so hopefully we can carry that momentum into the playoffs against a tough Reading team. Stay tuned for those results. Away from the field most of my focus of late (other than this past weekend when my girlfriend was in town) has been on cleaning and packing up my apartment so that whenever our playoff run ends I can throw all my stuff in my car and leave at a moment’s notice. This is genuinely one of the worst parts of being a minor league baseball player. The awful bus travel, getting paid like an unpaid summer intern, crappy hotels, distance from family…the hassle of moving out at the end of the season is right up there with all of that. The reason being that as players we are entirely responsible for setting up our own housing so despite the fact that we are setting up what amounts to temporary housing in our minds we still have to set everything up as though it were our permanent residence. Throw in the facts that guys move around during the course of the year and that we don’t know our move-out date because we are in the playoffs and it is a major headache. Our cable and gas bills are set up through players who are no longer in Akron and getting a final walk through on our apartment will be impossible so we will be at the mercy of the complex management on the final condition of our apartment. Fun times for all, capped off by long drives for most of us. Aside from dealing with the annoyance that is our apartment situation I have been doing my typical reading, painting and exploring the area on foot when I get the chance. On the heels of the sale of my first painting I decided to go back to the well again so I am working on selling another recently completed piece, again of what I would consider to be dubious workmanship but I guess beauty is in the eye of the beholder. On the reading front I recently polished off Mayflower by Nathaniel Philbrick and I’m currently working on Richard Wright’s masterpiece Native Son. I meant to read Native Son a few years ago when I went on an African-American literature kick over the winter, but I am just now getting around to reading it and I have been totally absorbed since the moment I picked it up. Well, I should really get back to packing and cleaning before I head to the field. Look for updates on the playoffs as they unfold and until next time, enjoy this poem. around themselves, trying to remain in their own night. his elderly sleep-soft eyes checking for the total effect. that all our secrets from one another are imaginary. After a recent paucity of postings I’m taking the bold step of posting two entries in two days, so consider this a makeup assignment of sorts. I was pleasantly surprised by the response to my recent article on National Poetry Month and even had the distinct privilege to hear from one of the authors on my list of poetry favorites, Anne Pierson Wiese. As the type of person who never really needed much encouragement to write about things like poetry in the first place, I am going to take advantage of the momentum from the first poetry post to go ahead and incorporate some more poetry into my entries for at least the duration of the month and maybe beyond. So continuing in that vein I’d like to share a couple poems by W.H. Auden before returning (mostly) to more baseball related stuff in my upcoming posts. Enjoy. This first poem requires a bit of a footnote. 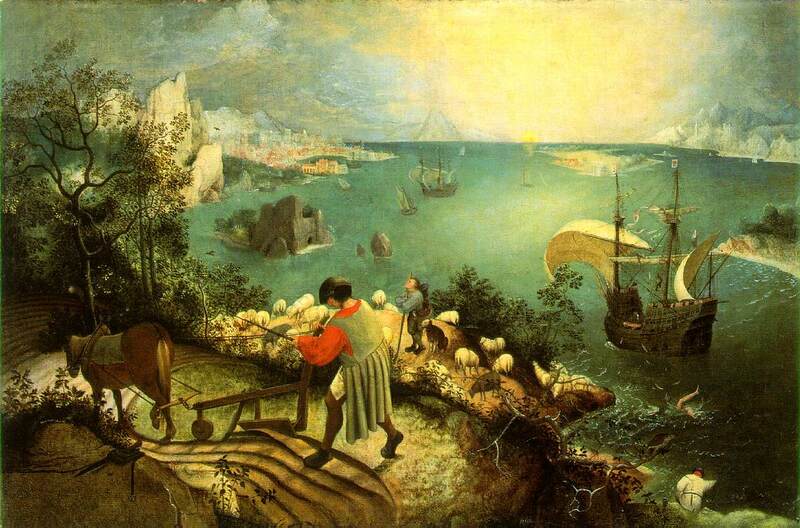 The title refers to the name of a Belgian museum that houses a painting called Landscape with the Fall of Icarus, ostensibly by the elder Pieter Brueghel. I have presented the painting for you viewing pleasure, but the specific history of the painting and its subject matter both make for interesting additional reading if you care to do some additional reading. ‘O look, look in the mirror? Hello again and for the last time from sunny Arizona. Today was the last day of spring training before breaking camp early on Sunday (as in 4 am early, the Indians don’t mess around) for Akron, Ohio. So my next installment will probably be coming to you live from the Canal Park clubhouse while I wait around to see if they can clear the two feet of snow off the field and get the game in (just kidding… hopefully), so look forward to that. As for actual baseball, I had my last outing of the spring Thursday and went out on a high note with two good innings, capping off a spring completely devoid of any road games–a “perfect spring” if you will. With the obligatory baseball coverage out of the way, I’m going to devote some time to a completely unrelated topic. As I’m sure literally dozens of people across America are aware, April is National Poetry Month. Now I realize that reading poetry is not exactly at the top of the list of things that most people tend to spend inordinate amounts of free time doing, but it is a rewarding and engaging way to invest some spare time now and then in place of watching television or playing video games. As the great American poet Robert Frost once said, “Poetry is a way of taking life by the throat,” and amongst the many books I read over the course of the year the poetry tends to be some of the most impactful and memorable. Not being a poet myself (sad to say), I won’t make an extensive attempt to describe the virtues of poetry, but for those of you who are interested in learning more I’ll give you a list of some of my poetic favorites that would provide a great starting point. I would also direct you to the website for the Academy of American Poets at poets.org, where you can find information about poets and poetry, get information on events in your area, and sign up for the poem-a-day feature to get a poem from an American poet delivered to your email inbox everyday (one of the few emails I look forward to reading on a daily basis). Enjoy. I first stumbled across Stephen Dunn about two years ago and he his books have quickly become some of my favorite reading material. His best known book is Different Hours which won the Pulitzer prize for poetry, and he has a number of other excellent books including Everything Else in the World, Between Angels, and what is probably my favorite collection of poems–The Insistence of Beauty.